Note that the product brand is Andoer, not is SJCAM brand. 90 degree wide-angle lens.With waterproof case for taking wonderful video underwater up to 30 meters. Support burst, time lapse and continuous shooting. Support EV compensation, shutter control and PC camera. Support Micro SD Card up to 32G. (Not included). Mini size, light weight, easy to carry. Comes with many accessories, such as bicycle stand, base mount, bandage and so on. 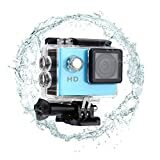 Camera can be mounted on helmet, bike, car windshield, and other similar objects, suitable for outdoor sport like riding, skiing, climbing, etc. This entry was posted in Discount Photography and tagged 720P, 90°, Action, Andoer®, Angle, Camera, lens, Mini, Sport, Waterproof, Wide by Ball Photo. Bookmark the permalink.